1. Book onto one of our open classes costing £35 per person (+ £3.32 booking fee). 2. Request a private class with any of our chefs, £45 per person (£360 minimum price – i.e: 8 people). For example, we can run the cookery class in your office building! We bring portable stoves, pans and kitchen utensils so the only thing we need is a sink to do the washing up after the event. Normal class price of £45 per person + £100 venue fee (minimum of 8 participants per class). If you are a charity or social enterprise please email bookings@migrateful.org as you may be eligible for a discount. During a Migrateful cookery classes you will work with your group to prepare three or more dishes to be served family-style. Some dishes are prepared by the chef and demonstrated to you, while some dishes will have you preparing it from beginning to end, all while learning our chef’s authentic techniques from their home country. Our classes appeal to those interested in learning international recipes, practising a different language and in meeting new people for a cultural exchange in an intimate home setting, as well as to those wishing to support migrants and refugees struggling to rebuild their lives. Migrateful’s classes offer much more than just a cookery lesson. Migrateful offers a novel experience, with an added “feel-good factor,” knowing you are benefiting those in need. 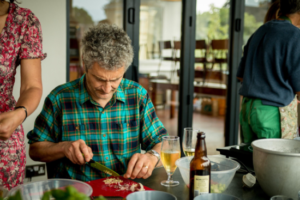 It’s a chance to make a new friendship with the chef and to give them an opportunity to share their story in a setting where they feel empowered, cared for and supported. The facilitation of this friendship is extremely valuable to both chef and customer and unlikely to happen otherwise in the midst of busy city life.